Close range support troops of the Diseased Sons are Plague Marine Havoc Squads. I painted these squads purple. Only a few months after I strip a dozen or more heavy weapon armed Chaos Renegades, Nurgle marked squads will be able to have heavy weapons again. Further arguments against never stripping your models. Some of them were badly painted and will end up as undivided troops, but some of them will go in my brown squad which will be my true heavy Havoc squad now. I'll end up with several squads that can be either Plague Marines, Nurgle Renegade Tactical Squads or Nurgle Renegade Havoc squads under the upcoming new rules, when I get everything painted which may be some time in 2008. Take me back to the old school. 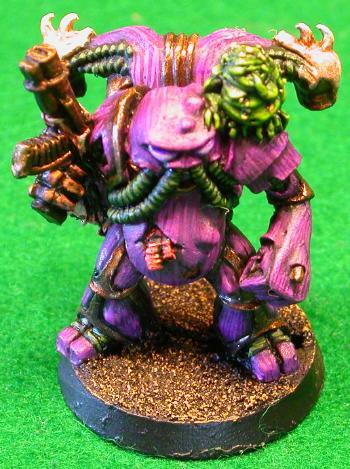 This is one of the first 11 Nurgle Chaos Space Marines I ever painted. It shows, but with minimal touchups over the years it still looks presentable on the table. None the less I repainted it, see below. Purple was the color I chose for my devastators. I was partial to Plasma Missiles in 2nd edition. I even won a tournament with my unique strategy in Ottawa. Now they're just bolter toting tactical squads, hoever in the 4th Chaos Codex they will return to being Nurgle renegades with a selection of heavy weapons available to them which I will be painting or re-painting as the case may be. This squad is getting a champ and an icon which I converted but haven't had time to paint due to concentrating on models actually needed for my third GT army. This original Nurgle painting style was very dry brush dependant. I used black, then ghoul grey, then worm purple, then fire dragon crimson I believe. Purple squads have pink insignia and eyes. I believe the gun and brass striping was added later with other possible touch ups including "Puss Rules" written across his belly. Historically this squad is used the same as Purple I. This is the exact same model as above. I stripped it using slightly diluted PineSol. When I repainted it I used a black basecoat then worm purple then fire dragon crimson then I blended in some tentical pink. I used the tiny line style. I also used a new technique on the metals. The pictured model was part of a batch of 10 more models armed with bolters. I also painted some of the new multi-part all metal Plague Marines. I was in Japan at the time so I had a limited number of paints with me. I tried to keep them a bit darker than the previous batch of purple marines. This was among the criticisms leveled at me by quasi anonymous posters at the Deathguard.org forums. Alas the thread must have gotten too old as it is no longer on that site. This can be added to my reasons why I'm not a big fan of web forums. Of course none of my critics had anything constructive to say, nor did they expect me to come across their little thread. Nor did they show any pictures showing their superior painting techniques. Nor did they see the models in real life. In real life no one in over ten years has said my models were too bright. If you've ever tried to take pictures of miniatures for display on the web you'll know it is tough to get the colors just right. I tend to use as much light as I possibly can when taking pictures which makes them look brighter I guess.